Media and Contents: 55 parts arranged on two sprues of caramel coloured styrene, a sheet of clear acetate and decals for four subjects. The Opel Blitz, the workhorse of the Wehrmacht, saw service through out World War Two and on all fronts wherever the German Army went. 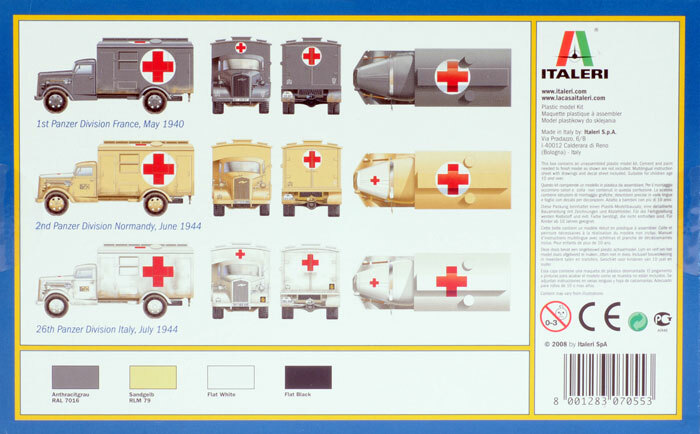 This versatile medium truck was produced in various forms and is mainly remembered as a troop and supply transport, however it also found application as a tanker, mobile workshop, anti-aircraft gun platform and the subject of this kit, an ambulance. This kit will not be new to many modellers of AFVs. It is another in the series of re-releases of the old, but excellent for their time 1/72 Esci military vehicle range. This kit must be at least thirty years old, however even now it holds up fairly well as a representation of the Blitz. 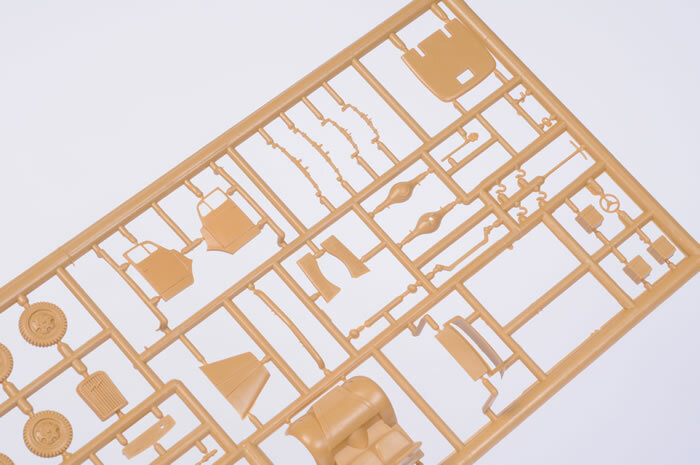 The main sprue contains all the parts required to make the truck cab and chassis, while a smaller sprue provides the parts for the ambulance body. Detail is a little lacking when compared to more modern 1/72 renditions of the Blitz; the cab contains only the seats, a crude dashboard and steering wheel. The chassis is made up of the suspension springs, differential, drive shaft and exhaust. The engine is designed to be closed up under the hood, what little that can be seen is represented by the bottom of the sump and transmition. The wheels are detailed only on the outer surfaces and what detail there is here, is a little on the soft side. 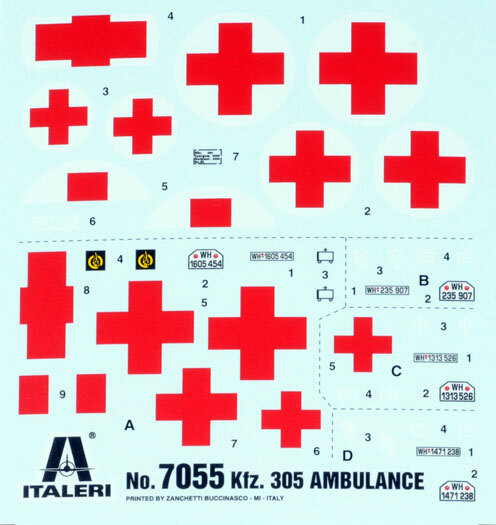 Italeri has improved the kit by providing a clear acetate sheet and templates to allow the modeller to cut out the windows and windscreen. 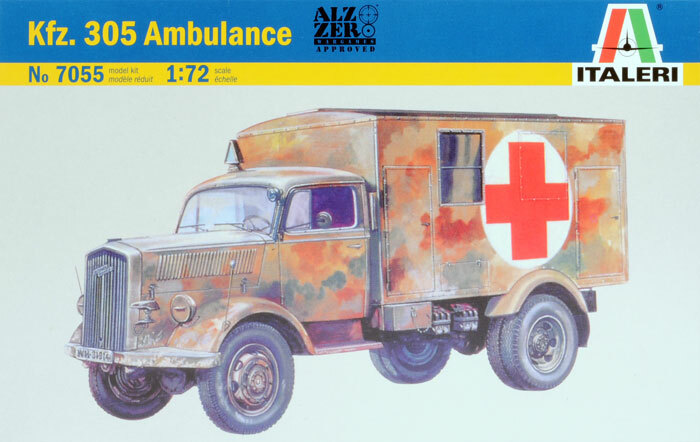 Probably the main attraction of the kit is the subject; an Opel Blitz ambulance, I don’t think any one else makes one. To this end we are provided with a fairly simple boxed body with a curved ventilated roof. The rearward swinging doors can be positioned opened however, there is no detail to see inside should the modeller choose to leave them open. The exterior details such as windows and doorframes are in raised relief and are all “buttoned up”. 1st Panzer Div. France 1940: All over Panzer Gray. 2nd Panzer Div. Normandy 1944: All over Sand Gelb. 26th Panzer Div. Italy 1944: White Wash over Sand Gelb. 8th Gebrirgsjager Div. Italy 1945: Olive and Red Brown over Sand Gelb. Just as the Opel Blitz was a workhorse of the Wehrmacht, this kit was for a long time a workhorse for many 1/72 AFV modellers of years past. I feel it has now seen its time and it has been completely eclipsed by more recent releases. It would still make into a presentable model of the Opel Blitz, however an outstanding result would not come without considerable time and effort. Therefore this kit is best rated as an inexpensive, easy to assemble and sufficiently detailed model that would be most suitable to the wargamer rather than the average modeller.